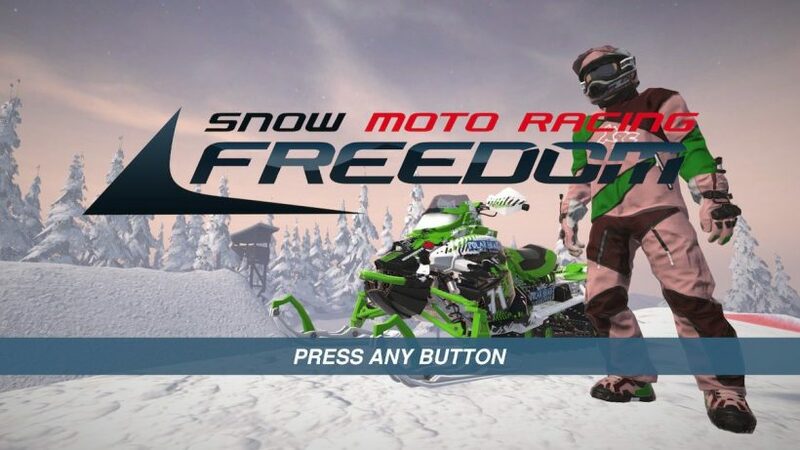 Released alongside the almost identical-looking Aqua Moto Racing Utopia, Snow Moto Racing Freedom offers more arcade racing action. Given a very limited UK release, your best chance of picking up a physical copy of this is to turn your attention to Italy, which is where I picked my copy up (thanks Gamespot…). That REAAAALLLY subtle orange beam blots out the landscape… I mean, tells you where to go. You are able to pull off tricks on the go by pushing the right stick in any given direction, but much like would be the case in any Tony Hawk’s Pro Skater game, your timing needs to be right for this. Hold the pose for too long and you’ll go tumbling, and the same will happen if you attempt the audacious and try to pull off a stunt while heading over a jagged rock or when making an awkward landing from a big jump. It does feel like an arcade racer, and the gameplay is really easy to pick up. Simply push down on the R button to floor it from the starting line, then it’s a slalom to find the quickest possible route between checkpoints. The challenge comes in the checkpoints which are facing the polar opposite direction. It’s night-time now… but still that damn orange light is still there. No idea what that light is though. Maybe it’s the moon. Who knows. In order to pull off the smoothest possible turns, you need to lay off the accelerator and push the ZL button to perform a sharp turn, and even then, there’s the distinct possibility that you’re going to mess it up. Miss a checkpoint, particularly the ones which are heading down steep hills, and you’ll have yourself a really annoying time trying to perform a u-turn in order to pick it off. Even in the easiest difficulty levels, a misstep like this is going to cost you the race. 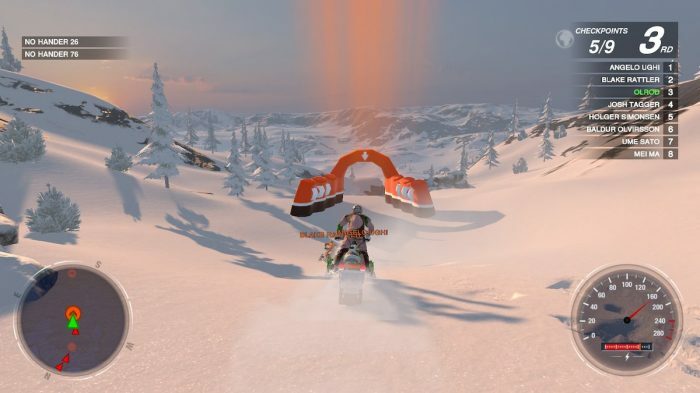 That’s the Sprint race option covered – the other option is Snocross, where the action is more enclosed, and you’ll have less opportunity to whizz back and forth from checkpoint to checkpoint and see the trailing pack zooming around behind you. Complete championships in both of these sports and you’ll unlock a combined version of the two, the Freedom League. You can’t miss the checkpoints… until you miss them, and usually have to embarrassingly force the snowmobile back up the hill in order to go through it again. Visually this is pretty plain. Admittedly, there’s only so much you can do with a sea of shades of white to represent snow, but other than an odd chalet from place to place, the only things to really look at are the hills and bumps across the course. You can amend the time of day of the race, and of course the night-time option at least switches the white sky for a dark one. There’s also a range of different courses to choose from, but other than the steepness of the inclines, there’s not a ton of variation between them. 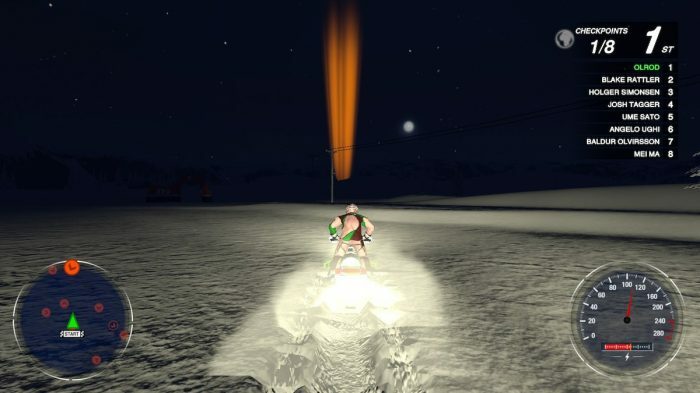 Orange beams illuminate the sky whether it’s night or day to point you in the direction of the next checkpoint. 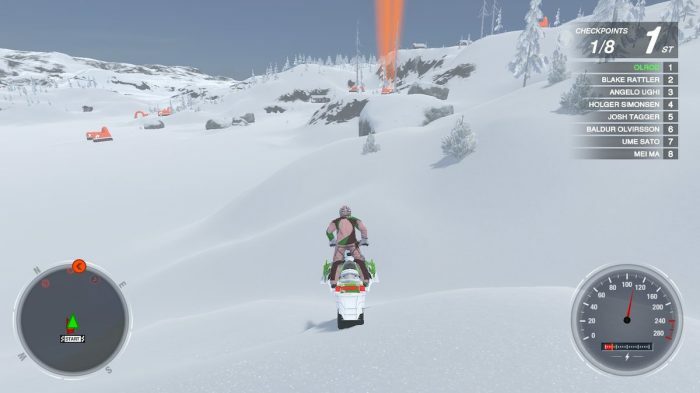 But it’s got to be said that it certainly is thrilling to storm through the snow on your snowmobile, leaving the trail behind you in the snow and whizzing across peaks and valleys all while in the spirit of racing competition. No, it certainly is not the most polished effort, but with no sign of a release for Steep on the Switch any time in the foreseeable future, this is your exclusive snowsports offering for the moment, and it is fun to play. Just don’t think you’ll remember it much when you boot up the next game, though. This game was always going to be paired alongside Aqua Moto Racing Utopia – after all, the two games basically the same and came out on the same day. Looking at it on its own, though, it is fun arcade-style action, but it’s not going to be winning any racing game awards any time soon.